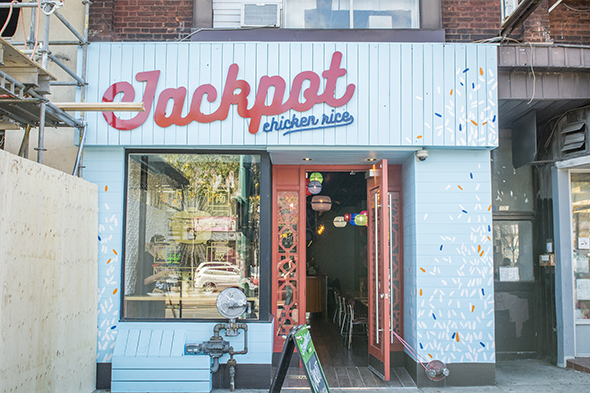 Jackpot Chicken Rice is a venture from Craig Wong and the rest of the team at Patois . 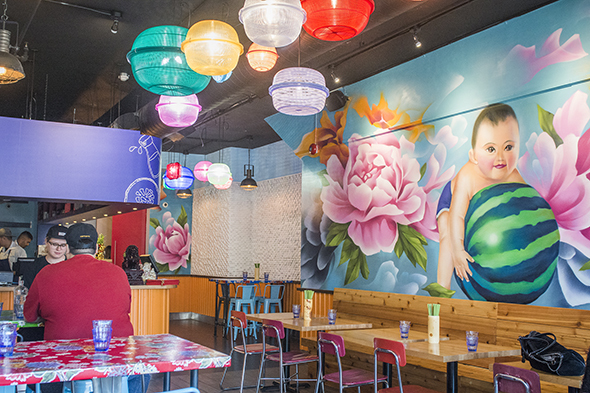 The Chinatown restaurant abuts the Chinese shops, markets and restaurants that crowd the area, with a baby blue exterior and bilingual menu. Everything is painted in happy colours and there's a huge mural. The tables are decorated with joyful patterns, and functional rice colanders of varying sizes, shapes and colours serve as lanterns. Jackpot lives up to the bar reputation of Patois: they have local beers, and also do cocktails. 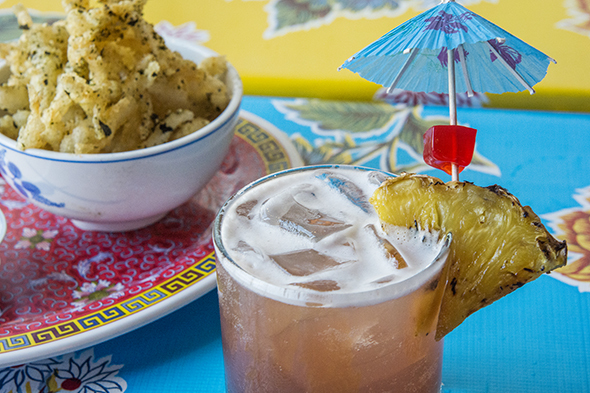 Their spin on a Singapore Sling ($11.95) is more liquor-forward, cutting out a lot of pineapple juice, garnished with caramelized pineapple and a coconut cherry jelly. 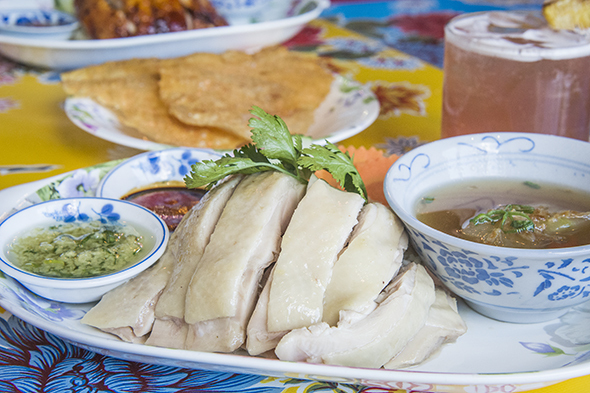 The signature Jackpot Chicken Rice ($13.95 for a meal) is tender poached chicken served with rice made with a stock using the chicken's liquid. I'd recommend getting the traditional soft skin version even if it seems off-putting to you texturally...it's a different experience, the chewy skin gathering the side sauces. Add amazing crispy chicken skin crackers for $2. This and the Roast Chicken Rice ($14.50/meal) both come with a savoury, yet citrus-y winter melon soup. 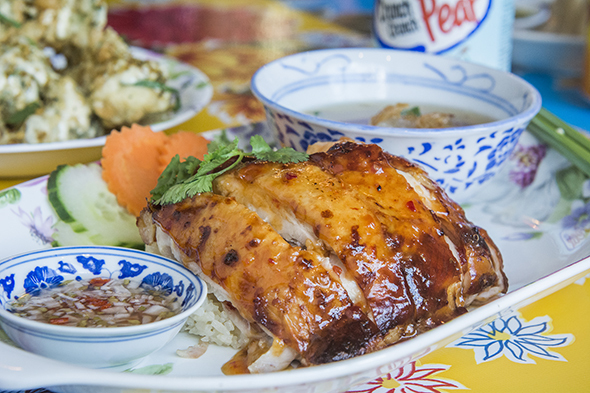 This chicken is sambal glazed which gives it a more pre-defined, sweet and savoury flavour, but that goes well with the thinner, vinegary sauce it comes with. 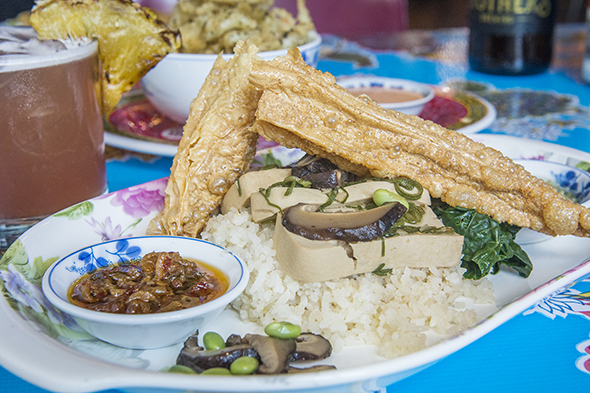 So vegetarians aren't left out, Wong wanted to create something that would allow them to share in the experience with a vegan chili soy braised tofu with edamame served on a mushroom rice. It even comes with veggie XO sauce you'd swear had fish in it, and crispy "skins" that are actually soy sheets. 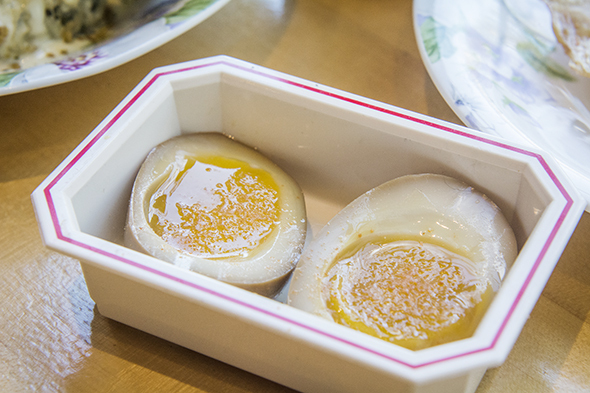 For $3 get the best soy sauce egg, supremely salty but flavourful, an egg cooked super gently and marinated in soy sauce mix for twelve hours, topped with a sriracha salt of Jackpot's own invention that also lends its powers to the crunchy chicken skins. 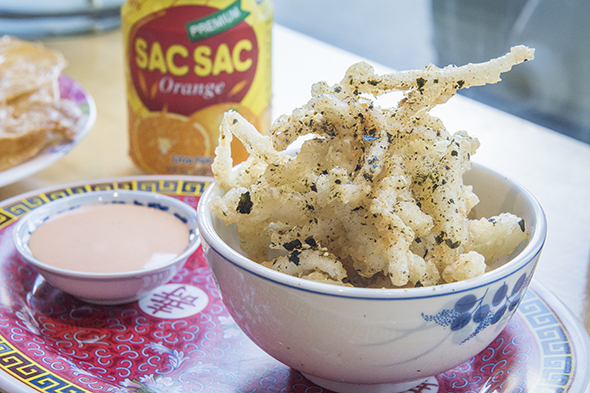 For one side we grab a baby fish fry ($6), fried white bait with a homemade furikake crumble of fried shallots and kaffir and served with spicy mayo. 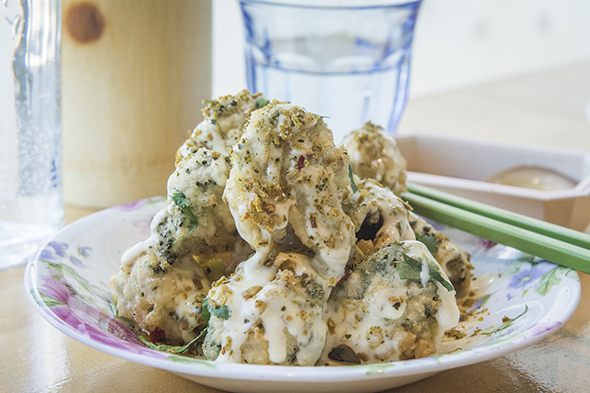 For our other side, we do the kaffir broccoli tempura ($5) dressed with a lemon-kewpie mayo and cilantro and lime leaves.